What’s the secret to dealing with negative emotions? Some people say you should ignore negativity and focus on being positive. Other people advise you to try meditation or yoga or some sort of spiritual practice. But according to Master Buddhist Thich Nhat Hanh, it’s actually more simple than that. In a brilliant passage below, Thich Nhat Hanh explains how to use mindfulness to deal with negative emotions. Facing our emotions and accepting them are different strategies than what we’re usually taught. Most people prefer to hide from negative emotions because they’re too difficult to bare. Negative emotions fester in the background and eventually bite you back even harder. “When we are angry, what do we usually do? We shout, scream, and try to blame someone else for our problems. But looking at anger with the eyes of impermanence, we can stop and breathe. Angry at each other in the ultimate dimension, we close our eyes and look deeply. We try to see three hundred years into the future. What will you be like? What will I be like? Where will you be? Where will I be? We need only to breathe in and out, look at our future and at the other person’s future. This is incredible wisdom from the Buddhist Master. If there’s one thing that’s true, it’s that the universe is constantly changing. So when we’re experiencing negative emotions, we need to understand that it won’t last forever. And we can’t rely on possessions or status to make us happy because those things don’t last forever, either. 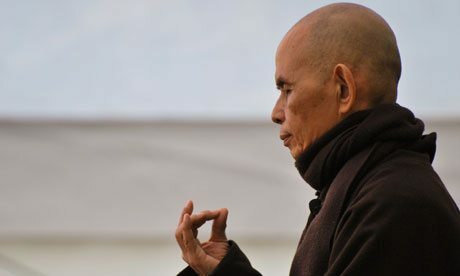 Thich Nhat Hanh says that happiness and suffering are like two opposite ends of a pole, and you can’t have one without the other. I do not take this article’s message to be “forget positive thinking.” It has a remarkably Christian undercurrent if not taking a veritable page from the new testament. I appreciate this article very much. I think the Buddhist notion that life is suffering , at face value is a dramatic exaggeration. Of course suffering is real to someone in a traumatic accident, or victims of violence or malevolence, but for most of us today, we think we suffer if our phone dies, or traffic backs up . I think life essentially is struggle, struggle is growth and growth is continuous. The use of tenderness in the face of suffering is natural to someone that does not suppress the anima or maternal feminine aspect. Those that do suppress it as a weakness can only react with suffering or rage in response to the stimuli, making rational decisions difficult at best. Would it depend to a great deal on the character of a person on how much they suffer? Also, if you are suffering but do not feel you are suffering, are you actually suffering? Last, is suffering totally context dependent and totally subjective? Suffering is like art: you know it when you see (feel) it. To some, it is their responsibility to carry the burden that some would call suffering while others suffer needlessly because of their own character flaws. If you see someone in need because of their own making and you can guide them out of such a condition but they refuse and you feel bad, you suffer because a solution is both possible and not possible, you suffer, right? Perhaps you see a problem that you feel great empathy for but know there is no solution, you suffer, right? Suffering can be physical or mental and both may be very painful. Many do not understand the suffering that hurt people in the mind. I think the article is addressing how one deals with one’s own suffering. Now wait, I thought as adults in the room we teach the children to be proactive, address their problems, not to blame others. Because we, humanity, have not solved the problem of eternal life through science it does not have to solve any problems. Think about that, we find the magic pill and no one needs to die. Now we have real problems. So, the end of suffering is just the start of much worse suffering. Those hunter gathers 40K years ago had it best and it has been down hill since then. I think the sort of suffering the poster had in mind is the sort which is exemplified by being ostracized for thinking differently rather than the sort which is exemplied by being a Syrian war refugee. I have been ostracized for thinking differently since I was 10 and entered the world of science fiction and science. People did not understand me and avoided talking to me. In science fiction most of the stories took place in a universe technology advanced and lacked problems caused by the bias we see from humans. In these stories there were problems but they were mostly resolved and religion and human flaws were avoided. I also looked for people with exceptional imaginations and too often when I looked for this in a person they did not understand and ran away.